Disclaimer: The image on this page is not owned by titheenvelope and is used solely as a design example. Please use the link at the bottom of the image to see its original source. It is important to have a set of professional and elegant envelopes when sending out business or personal letters. Envelopes help keep sensitive information secure, especially when using security or bank envelopes. Choose between 1-color or full color envelopes. 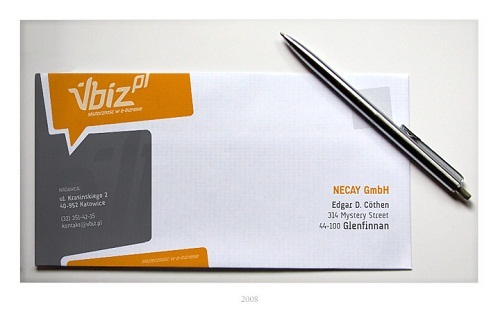 There are two common envelopes types: 1-color and full-color envelopes. You need to determine which would suit your need before planning the design and printing. This would also help you calculate the cost when it’s time to produce your project. Plan the colors and details of your design. Since the appearance of your envelopes aims to impress the recipient, you may want to work on the colors and details. Be sure to make it look professional and elegant. You should also consider the size of the envelopes to avoid overcrowding the design. Use a template. It would be easier for you to start creating envelopes if you use a file setup template. It can help you create design in the inside and outside portion of the envelope. You could also add creative details on the inside flap. Be sure to follow the guidelines when inserting the design the flap to avoid losing your design when printed. Prepare your file for printing. When you’re done working on the design, you should save your project in a format that would be ready for printing. This would help you avoid corrupting or losing your file when it’s time to produce the envelopes. A basic format is PDF which is widely accepted when printing online. You should also set the color format into CMYK if needed. Think about the printing options. There are two ways for you to have your custom envelopes. You could either print these using your personal printer or choose an online printing company to handle the job. The choice would depend on the number of envelopes you’ll need. If you also want to have professional and convenient envelope priting for your project, then a trusted store could provide you with this service. We hope these simple tips could help you work on the design and printing of your envelopes. Remember to consider what your recipients would think of upon receiving your letter. You should also take time in planning the production for you to get the printing quality that you want.